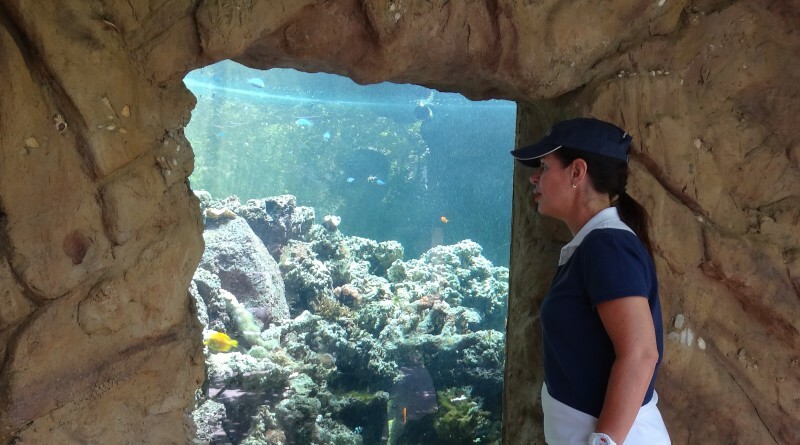 Patty Elkus, emeritus board member of the International Seakeepers Society who is launching the organization's West Coast Discovery Yachts Program, points out exotic fish in the "grotto" or aquarium her husband Rick built at their home and uses for marine research. The grotto, currently inhabited by fish from the Coral Triangle of Indonesia, helped inspire her love of the oceans and their conservation and commitment to Seakeepers' ocean research. Have you ever wished you could make your love of the ocean more meaningful? Or even transform your boating forays into scientific expeditions? At the Superyacht Summit I attended in San Diego recently, I met Richard Snow, president and CEO of the International Seakeepers Society, a Florida-based non-profit founded in 1998 to connect the yachting community with the world of oceanographic research, conservation and education to heighten awareness of ocean issues and promote marine research. The organization’s Discovery Yachts Program pairs marine scientists with boat owners interested in supporting and participating in this research by providing their vessels as platforms for a wide range of studies and projects. After debuting four years ago in the south Florida/Caribbean region, where about 20 vessels participate, it’s about to expand worldwide. Discovery Yachts just launched this spring on the West Coast, explained Patty Elkus, a San Diego resident and Seakeepers emeritus board member who’s taken the lead in planning and launching it here. The program, she said, is shaping up differently on the West Coast than in the Florida region, where most participating vessels are megayachts. Since the West Coast boating world is somewhat different from the East Coast, their goal here is to recruit owners of recreational vessels of all sizes, particularly those interested in traveling in Mexican waters, including the Sea of Cortez. In particular, La Jolla’s Scripps Institution of Oceanography, on whose Directors’ Council Elkus sits, works with Seakeepers to coordinate matching Scripps scientists, engineers and students with boat owners willing to use their vessels for projects collecting samples, gathering data, deploying instruments or conducting other forms of marine research. Among potential projects needing host vessels are studies of pelagic mantas and fish spawning and aggregation in the Sea of Cortez. “The scientists apply to Seakeepers, which checks which members have expressed interest in the Discovery Yachts Program and then tries to match the scientist with the yacht,” Elkus explained. At the Superyacht Summit, Capt. Tom Petersen of Channel Islands-based Valkyrie Yachts regaled attendees with his adventures and misadventures on Seakeepers’ first West Coast mission. He was charged with deploying off the Channel Islands a drifter filled with National Oceanic and Atmospheric Administration ocean monitoring and measurement instruments. Twice he and his crew launched the drifter where they thought it would catch the desired current; twice it quickly washed up on shore. The third time they targeted the right location; it drifted away towards Mexico. Elkus, a staunch advocate for ocean research and conservation, discovered her life’s passion unexpectedly. She and her husband Rick grew up sailing on his grandfather’s yacht in San Francisco Bay. Both have always loved the water and sea creatures, even constructing a 7,000-gallon “grotto” or aquarium at their home which Rick maintains and uses to conduct his own marine research. Although they don’t own a boat, both are certified SCUBA divers and enjoy diving around the world. When Rick suggested taking a Birch Aquarium-sponsored expedition voyage to Antarctica about 10 years ago, Elkus resisted. Once aboard, she discovered the trip transformational. “It was such an extraordinary experience, an epiphany. It opened up a whole new world for me,” she said. On the trip she met the then-chairman of Seakeepers, Donald Tomlin, who recruited her to their board, its first woman. She never looked back, becoming involved with several other organizations, including Mission Blue and Scripps Institution of Oceanography, dedicating her skills and philanthropic efforts to ocean advocacy. If you’re intrigued by Discovery Yachts’ research projects and would like to get involved, visit Seakeepers’ website at seakeepers.org, or email Julienne Beblow at julienne@seakeepers.org for more information.